When July rolls on in, the kids are loaded with energy, filled with the high of summertime excitement. They start running around the house, making all sorts of noise—asking, yelling, complaining—you name it! Suddenly, you’re stuck with the sour realization that you’re stuck with these little monsters for a whole two months! Now, what to do with these rascals? Well, camps can be super pricey and learning centers are downright boring, so what other options do we have? It’s not as if you’re a 24 hour circus clown or professional entertainer, so how can you keep these kids happy and busy without sacrificing your sanity? If you’re creative and open-minded, there are tons of great ways to entertain your kids over the summer without busting a whole in your pocket and time. When your kids are bored, you should encourage them to unleash their creativity. By engaging in long-term projects or crafts, they are kept occupied, but also develop their learning skills at the same time. Some ideas can include making a doll, creating a pet maze or building a toy car. These types of experiences are much more beneficial and meaningful than offering the usual distractions such as a TV show or iPad. In the short term, your kids may be gratified, but after a while they will become dependent on these resources for entertainment, instead of being able to create their own activities independently. Allow the kids to play dress up and put on a play. Kids love the opportunity to show off their costumes, while creating silly scenarios that get the whole family laughing. Encourage the kids to create their own costumes for the activity. For the best costume ideas , let your children to use materials and accessories from around the house to create an outfit. Not only will they be busy putting together a costume, they will also be spending time rehearsing the play. Unlike recess at school, when playing at home, your children are left all by themselves. Sometimes the transition from playground games to household loneliness can be a tricky adjustment. For this reason, you should set up a reward system to promote independent play time. Let them build a fort or work on a puzzle, anything to keep their mind active. 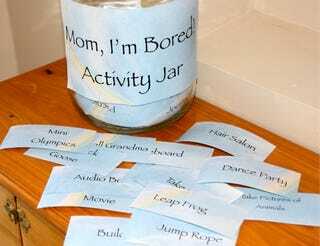 Once they have finished the activity, you can reward them with a snack of their choice or extra computer time. Just because the kids aren’t in school, doesn’t mean their minds need to turn into jelly. Research indicates that during the two months that children are not studying, they will forget 20% of what was learned the previous year. This means that you kids should keep their brains active by continuing to work with textbooks or writing activities over the summer. You can even consider hiring a qualified high school student for part-time tutoring job twice a week in your home. This schedule will give your child a sense of discipline and responsibility over their learning. Use all of these strategies for keeping your kids productive over the summer break. They will stay healthier and happier, and as a bonus, you’ll have some precious you-time to kick back and throw down a beer or two... finally!